Beginning December 6, aviation weather users will receive detailed updates on in-flight icing, which can endanger commuter planes and larger commercial aircraft. Graphical displays, developed by researchers at the National Center for Atmospheric Research (NCAR), will for the first time rate areas by icing severity and the probability of encountering icing conditions. The enhanced in-flight icing product is intended to increase safety and reduce flight delays by guiding aircraft away from potentially hazardous icing conditions, thus saving the aviation industry more than $20 million per year in injuries, aircraft damage, and fuel. In-flight icing has caused a number of fatal accidents, including the 1959 crash that took the lives of rock 'n' roll legends Buddy Holly, Ritchie Valens, and The Big Bopper (J.P. Richardson). In 1994, icing was implicated in the crash of an American Eagle ATR-72, which fell to earth in a high-speed dive near Roselawn, Indiana, killing all 68 people on board. In this photo, ice has accumulated on the wing of the NASA Glenn Twin Otter research aircraft during an experimental flight. The displays are part of an upgrade to a system called CIP, for Current Icing Product. They will be available to air traffic controllers, pilots, and other aviation weather users. The product has been developed at NCAR with funding from the Federal Aviation Administration (FAA). "This is a major advance that will enable dispatchers and even pilots to choose flight paths that avoid icing conditions," says Marcia Politovich, who oversees in-flight icing research at NCAR. "This product will help make commuter flights safer, and it will also enable commercial airlines to avoid the delays and excessive fuel costs associated with in-flight icing." Icy weather, including ice pellets and cloud droplets that freeze on contact, may affect air travel anywhere in the country, especially during colder months. 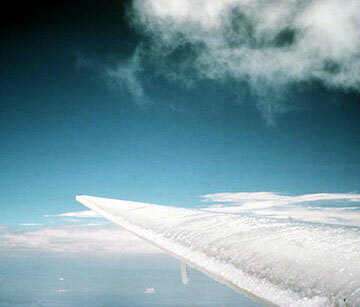 When ice builds up on aircraft wings, it can increase the drag on the airplane and make staying aloft more difficult. Even when aircraft are certified to fly through icing conditions, the risk can prompt pilots to detour for hundreds of miles. In 2002, the FAA approved the first version of the CIP as a tool for dispatchers to make fly/no-fly decisions, plan flights, change routes, and select altitudes. The high-precision maps and plots displayed online were derived from surface observations, numerical models, satellite and radar data, and pilot reports. The new version of CIP, which is updated hourly with selectable altitudes up to 29,000 feet, incorporates more advanced weather prediction models and more detailed observations. Instead of simply indicating the potential for icing, it quantifies the probability of icing encounters and their likely severity. Pilots of properly equipped aircraft will be able to fly through areas of light icing instead of detouring around wide regions with potential icing conditions. A major advance over the previous version of the CIP is that pilots will be able to access the maps in the cockpit, helping them to make course adjustments as needed. The new version of CIP will most benefit commuter planes and other smaller aircraft, says Politovich. Such aircraft are more vulnerable to icing hazards because they cruise at lower, ice-prone altitudes, below 18,000 feet. They also lack mechanisms common on larger jets that prevent ice buildup by heating the front edges of wings. Using the CIP displays, controllers will be able to guide incoming commercial jets so they avoid circling at altitudes where ice could accumulate. A study by the National Transportation Safety Board found that in-flight icing was responsible for dozens of accidents a year, mostly among smaller, general aviation aircraft. An estimated 819 people died in accidents related to in-flight icing from 1982 to 2000, with most accidents occurring between the months of October and March, according to the study. Cancellations and delays due to icy weather can cost airlines millions of dollars in a single day. On March 20, 2000, Denver International Airport was overwhelmed by an unusually large number of aircraft that, after circling because of heavy air traffic, landed with heavy ice buildup and then needed deicing treatment before taking off again. As a result, hundreds of flights were cancelled. The National Weather Service will operate the enhanced CIP from the Aviation Weather Center in Kansas City, Missouri. CIP will supplement but not replace the information in the NWS AIRMET, the traditional weather alert issued at six-hour intervals. Commuter pilots at Air Wisconsin, Atlantic Coast, ComAir, and SkyWest tested the technology and gave researchers feedback throughout the development process. The University Corporation for Atmospheric Research manages the National Center for Atmospheric Research under primary sponsorship by the National Science Foundation. Opinions, findings, conclusions, or recommendations expressed in this publication are those of the author(s) and do not necessarily reflect the views of the National Science Foundation. This research is in response to requirements and funding by the Federal Aviation Administration (FAA). The views expressed are those of the authors and do not necessarily represent the official policy or position of the FAA.